A number of methacrylate ionic monomers with different structures and mobilities of ionic centers were synthesized. The free-radical polymerization of these monomers in solution affords high-molecular-mass (M sD = 0.5 to 2.5 × 106) thermally stable (T dec > 170°C) polyelectrolytes or cationic or anionic “polymeric ionic liquids.” The conductivities of polycation- and polyanion-derived coatings are (7.4 × 10−10)−(7.6 × 10−7) and (4.9 × 10−10)-(1.6 × 10−7) S/cm (25°C), respectively. 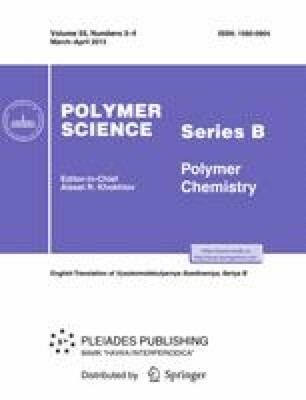 As exemplified by poly(1-[3-(methacryloyloxy)propyl]-3-methylimidazolium bis[(trifluoromethanesulfonyl)imide]), the molecular mass and glasstransition temperature of the polymer affect the ionic conductivity of the film coating. The transition from linear polyelectrolytes to crosslinked systems based on ionic monomers and poly(ethylene glycol dimethacrylate) 750 leads to the formation of elastic films featuring satisfactory strength, reduced glass-transition temperatures (−8 to +15°C), and increased ionic conductivity (up to 3.2 × 10−6 S/cm (25°C)). Original Russian Text © A.S. Shaplov, D.O. Ponkratov, P.S. Vlasov, E.I. Lozinskaya, L.I. Komarova, I.A. Malyshkina, F.Vidal, G.T.M. Nguyen, M. Armand, C. Wandrey, Ya.S. Vygodskii, 2013, published in Russian in Vysokomolekulyarnye Soedineniya, Ser. B, 2013, Vol. 55, No. 3, pp. 336–353. This work was supported by the Russian Foundation for Basic Research (project no. 10-03-00391-a) and the special travel project of the Swiss National Science Foundation (SNSF) (project SCOPES IZ73Z0-128071/1).